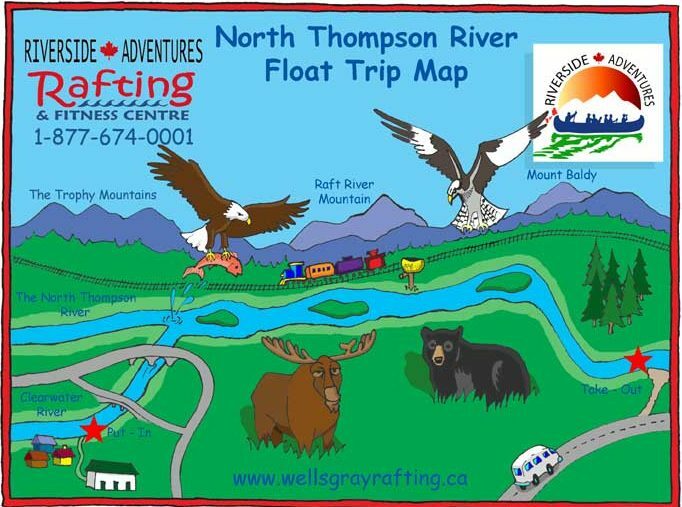 Scenic Rafting on the North Thompson River in Wells Gray Provincial Park, BC Canada! Recreate the pioneer experience by paddling this heritage waterway listening to folklore stories of early explorers and Hudson Bay Company history. Stretch out, relax, and enjoy a scenic, historic route down the original path of the Overlander Party on this North Thompson River rafting trip (suitable for all ages and abilities). All our British Columbia rafting trips use the best river gear available and are led by rafting professionals with outstanding guiding expertise and a vast knowledge of Wells Gray Provincial Park and the North Thompson Valley. The trip starts at Riverside Adventure’s RAFTING & FITNESS CENTRE where you’re greeted and welcomed in to go over trip financials and to sign a standard waiver that outlines some of the minor risks and hazards associated with river rafting. Once that is complete, you are directed to the trip meeting location where you’re outfitted with Personal Flotation Devices (PFDs) and any other equipment that may add to your comfort on the river, such as fleece jackets or baseball caps depending on the weather. This rafting trip in Canada is perfect for those wanting to stay nice and dry as they relax and enjoy all the scenic beauty that the area has to offer; therefore not a lot of specialty equipment is required. If you wish to bring along a camera or other personal items, the guide provides a dry bag in which such valuables can be stored. Other valuables can be stored in blue bins provided by Riverside Adventures. The blue bins are then securely locked up, under the care of a staff member who always remains on site at the Fitness Centre. Riverside takes great care in ensuring that you’re warm, comfortable, and properly dressed for the season. Once everyone is geared up, we have a short walk of about 200 meters down to the riverbank where we’re loaded on to the raft. We use an 18-ft. inflatable raft with rear mounted oars which the guide uses to propel and navigate the raft down the river. Since the oars provide the guide with full control of the raft, you are free to stretch out and relax and enjoy the weather and scenery. The float trip follows the historic route taken by the Overlanders, a group of adventurous frontiers men seeking a faster route to the gold rush that was taking place over a hundred years ago. This group were the first white settlers to explore this region and travel down the then uncharted North Thompson River. After the raft launches, it floats slowly down the Clearwater River. It soon passes under a logging bridge and then the Highway 5 bridge. Just past the second bridge, the Clearwater River meets the North Thompson River and the two rivers become one. This is a great point of interest because even though the two rivers meet, they don’t actually mix for about 5 km. The Clearwater River is mostly lake-fed, so it runs dark green and clear. The North Thompson however, is largely glacier fed, so it is colder and carries silt, causing it to run light green and a little cloudy. When the raft first enters on to the North Thompson, you can see a clear division between the light green and dark green water, as if there was an invisible barrier between the two of them. As the raft meanders down the North Thompson River, we’re often fortunate enough to view some of the local wildlife along the banks or the river or in the sky. The most commonly spotted wildlife along the river are ospreys and bald eagles. It’s quite breathtaking to watch either of these great predatory birds circling in the sky above you, scanning the water for prey. Then, if you are really lucky, see it dive through the air, splash into the water and instantly come up again with a fish locked in its talons. About halfway along the trip there is a large osprey nest that is occupied each year and in the spring you can see and hear the young Osprey chicks chirping wildly for food. There is also the possibility of spotting dears, elks or bears, though this doesn’t happen quite as often. In addition to the amazing wildlife is the beautiful scenery along the North Thompson River. The bright sun sparkling on the rippling, still water as the raft floats lazily through the dense woods and mountains is simply beautiful. We’re treated to about 18 kms of this amazing scenery, until we arrive at the takeout, where the raft is met by the Riverside bus. Here, we’re escorted out of the raft, up the bank, and into the bus. From there, it is a short 15-minute drive back to the Riverside Adventures’ trip meeting location. Our knowledgeable staff is also happy to give out information and maps regarding other adventures in Wells Gray Park. 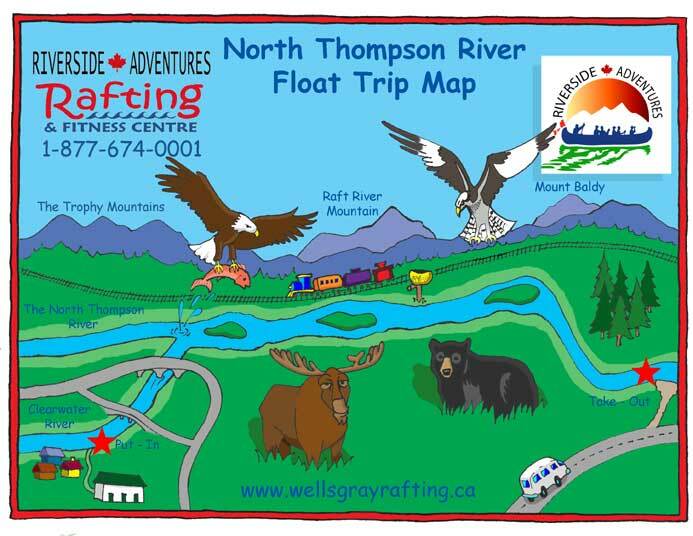 This completes a wonderful three-hour North Thompson River raft outing with locally owned Riverside Adventures Ltd. Our professional guiding staff take great pride in insuring that every customer is completely satisfied with their river experience. Please call us if you have additional questions or would like to make a reservation at 250 674-0001. We are located at 58 Young Rd, downtown Clearwater and offer regular departures at 4:30 pm. Call or email soon! River trips run rain or shine. Water levels fluctuate throughout the season, and may effect the section we are able to run.